So after a busy summer with bike rentals, training and guided training I finally have sometime to train myself! It feels great to be back at it (semi-seriously). So I’ve chosen two big objectives and the minimum of time to get ready for them. I need big goals, I simply don’t get motivated enough to train seriously without something big to tuck into. Now I have the objectives lined up and frankly, I’m feeling a pressure to train I haven’t had in ages. And me being me I want to (try) to win them, or at least be in the race. Obviously I am not completely unrealistic in my expectation… I realize there are going to be very fast, well trained and well equipped guys there. If I could manage a top 30 in Mallorca, followed by a top 30 in Bahrain I’d be thrilled. 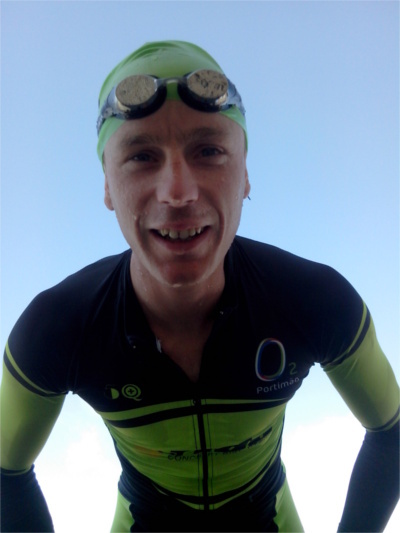 I raced a sprint triathlon the other week organised by Ricardo, our swim coach (it was very successful). I came 5th which was okay, because the field was quite strong and I lost 02:30 (which wouldn’t usually be a problem) in transition with the cycling shoes. Also, I was 10 days into training, so there’s a lot of work still to be done. I hadn’t ridden the road bike in three months, that felt odd too, but the bike ride was okay. The run seemed okay, I was only loosing a tiny bit to José Estrangeiro, an excellent Portuguese pro in high training for his first Ironman. He’s had some good results like 10th in an ITU long distance World Championship. The swim I lost the usual 1:30′ but I wasn’t too upset about that. It was a tight course, technical and with a lot of quick swimmers. I don’t like training for swimming, it bores me to tears, but I guess I should work on getting quicker. So I took the plunge and booked the races. Mallorca was a very special experience. Ever get that feeling when time seems to stand still, that days go on forever and you look back and think ‘wow, I can’t believe that was only four days, it felt like four weeks!’. Time stand still when you’re focused and doing a lot. The place (Paguera) was basically identical to ‘Albufeira’ and the other horrible coastal resorts here in the Algarve. It’s not my thing. Horrible food, bad service and very little ‘Mallorcan’ or Spanish about it: It was little Germany-on-sea. The scenery up in the mountains though was very nice and the roads excellent… Again very similar to some parts of the Algarve. The flora was identical to that here. I’d say staying in a guest-house up in the hills would have been fantastic. The active tourism has been wholly embraced by the island and it really got me thinking about the Algarve and how it suffers not having any autonomy as a region, nor is it governed as a region. The public transport was also impressive: the place was all inter-connected. I registered the day before and there was a bit of confusion there, but it got sorted out okay. Feed your inner bear. 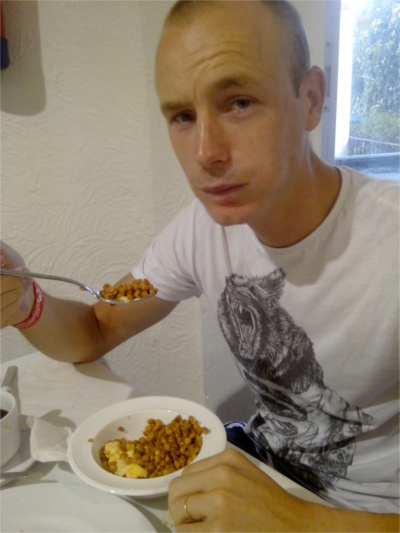 Lentils -the ‘super’ pre-race carb. Unfortunately ‘Celo Gardens Hotel’ wouldn’t make me some pasta (I’d bought) to go with them -they’re pretty revolting. The swim went well. It was without a wetsuit, my first such swim in a triathlon. There was another ‘bureaucratic’ issue with my tri-suit. Because it’s got sleeves they though it was a ‘swim skin’, something which is forbidden, so I had to roll them up which caused discomfort under the arms. Before the swim in the illegal ‘swim skin’ -it isn’t. In fact, it’s quite the opposite; more like a drag educing device. The mirrored goggles are well worth the money. I know if you look at the results from the swim, my swim looks mediocre, but the key part I trained for (power and a good start) was there. I couldn’t believe it when about 300 m I was right up at the sharp end of the group. I did fade quickly as I have hardly done any swimming and kind of lost confidence at that intensity… But 33′ without a wetsuit was good enough for me. I’m actually looking forward to improving. If I could get down to 28′ by Bahrain I’d be thrilled. On the bike it took about 15 km to catch all the age-groupers and I led from there (all bar one I think), occasionally swapping places with a strong Dane and a couple of Germans. Basically uphill I’d gain on them, on the flat they’d gain on me. The disk wheel I desperately tried to get going the week before would have been great here and worth at least 2′, but I settled for the old alu training wheel. I also went off course at one point and lost a minute or so, which was annoying, but could have been a lot worse had I not quickly realized: The markings aren’t as easy to follow as in cycling, where the whole road is closed… I miss that. I was annoying going off course, but frankly I deserved it for not doing a full reconnaissance lap the day before. Drafting like in a bike race, interesting dynamic would develop: ‘cyclists’ chasing swimmers, vs ‘swimmers’ defending and working together to keep the rest away, vs ‘runners’ wheel sucking and trying not to get shelled. Having a ‘reporting’ system where competitors can be flagged by other competitors and anyone spectating: 3 strikes from three different people and you’re out. The commissar would then serve to moderate the situation. After the penalty I punctured. I tried out that aerosol foam stuff which worked for about 1 km and then it popped again spraying foam everywhere, so I crawled in slowly to avoid the tire coming of the rim. Unfortunately it was a fast descent full of turns. I’ll need to get a pair of tubulars for future events. rolling into T2 punctured -Challenge Mallorca triathlon. After the fiasco on the bike and before, by the time I got to the run I wasn’t really racing, but I wanted to do a good run… I had run very well in training. Going well in training doesn’t mean anything and I struggled to get any ‘power’ down despite ticking along at a reasonable intensity: It goes to show that in this sport ‘quality training’ alone wont suffice, nor being ‘quick’; it is an endurance sport! So I’m going to start will some longer sessions now in preparation for Bahrain. I ran okay, the course was not easy and even the pros went slowly with 1:20 being the best mark I ran 1:38,05 and the course ended up being 22 km by my GPS… I hope I didn’t make a mistake on it. There was this extra little bit to make it add up to exactly 21 km… I’m wondering if we were only supposed to do it once! Turns out the course was long – 21.7 km officially. It could have gone better, but I’m happy with my performance. 7 weeks training, a lot of stuff going wrong and I came 6th in my Age-Group, 65th over all, with all the mistakes and some bad luck. Not bad… It was a European Championship after all and my first big triathlon. If you’re a fellow nerd, you might enjoy the data file: http://connect.garmin.com/activity/615184178 although Garmin Connect is very limited in what you can see. I’m not sure what the future holds in this sport, but I’d imagine I’ll continue doing a couple a year, they’re great fun… In a weird way. It was great seeing all the people in the open race just taking part and enjoying it. It was inspiring watching them battle to the finish and overcoming what they thought were their limits.